Whippet. Just say that word to yourself. Don't you think it describes the dog so perfectly? It's a name that sounds thin, sinewy and lithe. Annie, of beautiful, interesting and very readable blog Knitsofacto, (link to her blog here ), commissioned me to make a brooch of her dog Finn, after seeing the brooch I made of Eddie Spaghetti, (the blog post about him, and more photos, are here). Annie e-mailed me lots of great photos of Finn, taken from different angles, they were very helpful when I came to make him. I asked Annie if she would like something balancing on Finn's nose, and she decided that a leaf would be perfect, because Finn likes to chase leaves. I couldn't resist adding a few leaves, so he looks like he's running through a pile of leaves. Finn is an absolute beauty of a dog, with immaculate pedigree. Though I understand he didn't distinguish himself recently by demolishing Annie's knitting. Annie has done a blog post about Finn and the brooch here, her photos are superb, the light is beautiful, and you can see the brooch very clearly. I enjoyed making this brooch of Finn enormously, it was very satisfying to resolve various problems I came across when making him, plus, he has such a beautiful shape. Whippets are superb creatures, especially when they're not destroying your knitting. I have two Miniature Wire Haired Dachshunds, and I'm very excited to report that I've found a blog entirely devoted to Dachshunds. Heaven! The link to blog The Long And The Short of It is here. It's a blog for "Dachshundists". I must be a Dachshundist, because one of the reasons I visit Penny's blog Planet Penny, is to see Higgins, her Miniature Smooth Haired Dachshund. He's a character, and very, very handsome. One thing I do on the rare occasion I come across other Wire Haired Dachshunds is compare them to our two Dachshunds, especially their personalities. I've found a short video on The Long and The Short of It blog which shows a Dachshund feeling very pleased with himself about carrying his own little suitcase around. It could be my little boy, Douglas, in this video, here. Douglas does the same whole bottom and tail wagging thing, sometimes accompanied by a great big smile, which is always a special touch. This weekend I'm going on a course to learn how to do screen printing, I'm very excited about it. I'll give you a full report in my next blog post. Flowers of the hedgerow made by yours truly. Hello............ my blank and lethargic blogging mind has suddenly become a chirpy, perked up blogging mind. That's why my blogging has been so erratic, I'm sorry about that.................. but when you think about it, it's bound to happen occasionally isn't it? Sometimes it's a struggle to keep blogging every week, plus working hard at all the other things I do, without feeling worn out. But enough of that, here I am, with a little blog entry, saying hello, and showing you a teeny weeny bit of what I've been up to lately. I'll be using these flowers, which aren't finished yet, in the jewellery I'm making. I would loved to have worked them in porcelain (!) but sadly I don't have access to porcelain making facilities. I've had to make do with paper mache, which is very, very fiddly (I'm talking tiny, thinner than a bit of skinny string, strips of paper here). These flowers are going to be painted with a minituarist's paint brush, applying tiny detail that a mouse would hopefully be proud of (well, that's the sort of tininess I aspire to, a mouse would probably think my work a bit slap-dash). At the moment, things like these seed heads, collected on walks in Spain, are inspiring some of my jewellery. There aren't many walks I go on where I don't pick up a fallen leaf, or moss covered twig that's been blown to the ground by the wind, a feather, or a dried empty seed head. Thank you nature, for your lovely gifts. Bologna Book Fair, the place all the publishers take their new books to sell, is happening soon, and I'm in a flurry of activity trying to get as much of the book I'm working on, finished in time to take it to the Fair. In the midst of all this, I had a very nice journalist called Tamzin Lewis, from The Newcastle Journal phoning me up to conduct an interview about "The Pig's Knickers" last week. Tamzin wrote a wonderful article, she writes beautifully. There's an on-line version you can see here. Now I've got my blogging mojo back, I can say with confidence, see you next Tuesday, and have a fantastic weekend! 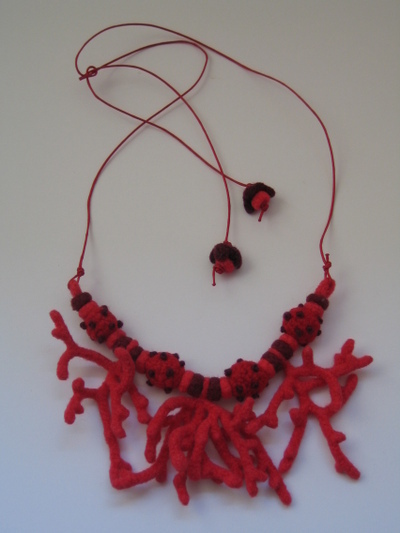 A Necklace in Two Parts. Hello! I'm thoroughly behind on all things bloggy, chiefly, saying hello to blog pals and visiting blogs. I'm so sorry about this, so sorry, something always has to give when things get stupendously busy. But on to other things, like my jewellery making! It's a new year, and things are evolving in every area of my work, from the books I illustrate, to my sculptures, and now there has been a progression in my jewellery making. Welllllll........ Fliss, from blog Joshy and Belle, you may find yourself going oooooooohhhhh wonderful! at some of the things she makes, the Debbie Bliss pattern for a fair isle top she's working on at the moment is amazing, the link to Fliss' blog is here. Fliss' writing is magical, and her new baby is very, very, sweet. I'm not sure how she manages to look after three young children, write a blog, run a home, have a job outside the home, and come up with wonderful ideas, but she does. 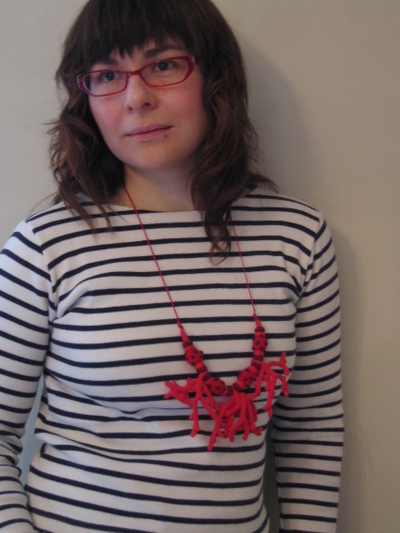 Fliss bought a holly and berries brooch from me, and then decided on the strength of the brooches I had made, to commission a necklace. For someone to have so much faith in you, over such an unknown quantity, feels amazing, and a bit scary, incase it turns out to be not up to much. 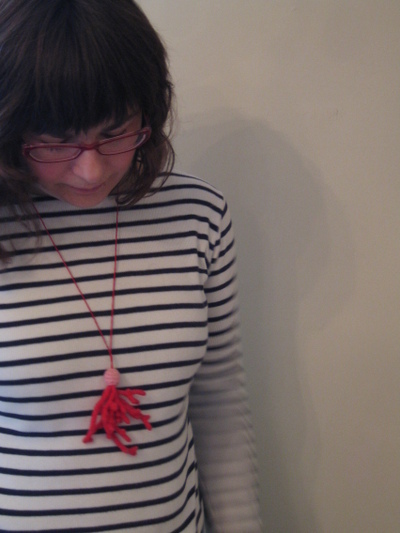 Fliss told me about her influences, images she likes, things she collects, and she asked for a necklace in two parts. A basic necklace that could be worn during the day, and then a part that could be added to make it more of a statement piece for the evening. So I came up with a necklace that could have a brooch pinned to it, and the brooch could also be worn on its own. Fliss is like a muse, she feeds me ideas, and I act on them. Fliss has been imagining a jewellery range for me, which is rather exciting that she has so much faith in me. At the moment, I'm spending spare moments making the components for necklaces and brooches. I've just been looking at the dog in the brooch above, and realised he needs a red collar! How annoying that I missed that. 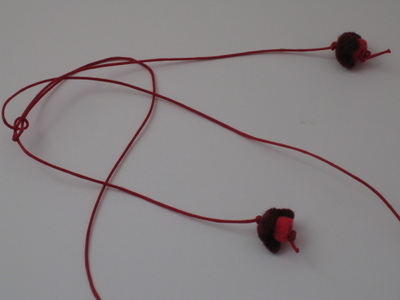 I did, however, put in finishing touches like little red bells to cover the knots in the ends of the cord, which Fliss can shorten if she finds the cord too long, by cutting the ends shorter and tying new knots. The details are important to me, like tending to the ends of cord or string. That expression "the devil's in the detail", I think it must be referring to the detail being devilishly difficult and trying of ones patience. For me, I find that "joy is in the detail", and is essential. If I had a mathmatical brain, maybe I could have been a watchmaker, I like sitting hunched up with my entire focus on a tiny thing. Such a nuisance I didn't apply myself enough to realise the dog should have been given a red collar. Sloppy of me. Well I must now apply myself to the making of a cup of tea, and the savouring of a little something sweet of taste. That'll be some chocolate then. Just before I go, talking of tea, Helen Stephens, a hugely talented writer/illustrator of children's books, came by to say hello and draw my doggies yesterday. Helen has a website here. Her work is magical and funny and touching. Her partner, Gerry Turley, was at The Royal College of Art at the same time as me, and I love his work too, which you can see on his website here. Hugo very generously gave me one of Gerry's gorgeous prints for my Christmas present. I like to share wonderful talent with you all, it's enriching, don't you think? Now where's that cup of tea I've been going on about? P.S. Something else to share with you, a rather wonderful giveaway from Lori, of superb blog Lori Times Five. If you read her magical blog post here, you will be inspired, and it will lead you to how to enter her giveaway, it's wonderful. The time for entering finishes tomorrow, Sunday 22nd. My Niece, Millie, has quite a bit of bling for her age............ five years old. And most of it is my fault. I buy her the majority of the stuff................. I think there might be a slight worry on her Dad's behalf that I'm cultivating a love of cheap, garish plastic jewelery in my Niece. Or maybe Millie and I just share a liking for bright colours. I often think that the jewelery produced for children is far more interesting than the more tasteful and restrained adult jewelery you find on the high street. Every time I buy a necklace or bracelet for Millie, it's touch and go as to whether it will actually make it as a gift, or will I wear it myself ? These photographs were taken when I was visiting my sister in London, and Millie wanted to show me all her jewelery................ Actually, that's a fib, I asked Millie to show me her jewelery collection! And then we both took photographs on my camera, so I'm not sure which of these photos are mine, or Millie's, (except the top one, that's definately one I took). When I buy these gifts for my Niece, I'm not sure who gets more enjoyment out of it, me or Millie ...................... It's probably me, isn't it? Something for little girls, (or big girls..............). .............I'm a huge fan of the colour pink, and all it's different shades ................. It's a happy colour isn't it? Hugo has a pale pink sweater, which I think looks great on him, and I love that pink gingham shirt he sometimes wears.......... I don't think pink should be the preserve of the female of our species. My Niece, Millie, has embraced pink with huge gusto............. like a lot of little girls, she's not afraid to wear pink, pink, pink, pink, PINK! So it occurred to me , when I was knitting her green cardigan, that she might be disappointed to not receive anything pink from me for Christmas. ................. 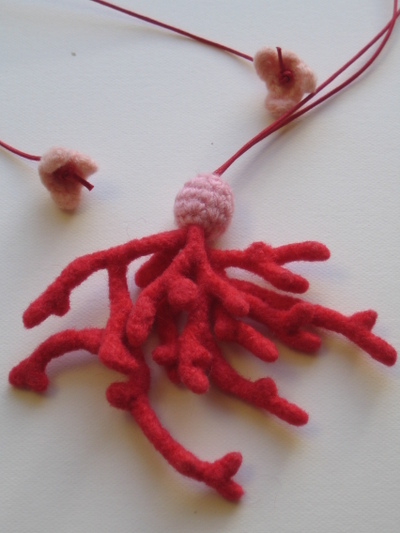 Since my first attempts at crocheting last year, I've been doing a lot of crochet jewelery, (which I must show you some time) .............. so it occurred to me that I should crochet a little something for Millie, something pink! You can't get much more girlie than tiny pink flowers can you? A tiny pink flower necklace............. A bit like the cardigan I made for Millie, I was making this with no time to spare .............. And I'm afraid that Millie's short modeling session of the cardigan I made her, was only just enough time for the cardigan shots, so unfortunately I didn't manage to get any photographs of Millie wearing her necklace. Apparently, Millie was carrying this necklace around with her all day over the Christmas period, in her pocket .......... I'm one of 'those people' who have a 'present drawer'. This was a box I picked up a couple of years ago, and stashed away in that present drawer, thinking, there will be a day when this will be the perfect box in which to place a gift for Millie............ One day............. The ooohhs and aaahhhs as this was opened on Christmas day, were thrilling to listen to! Not just from Millie, but everyone else in the family........... The sheer pleasure of hearing everyone's reaction was wonderful. So this was an all-round great gift really! Not only did I have the enjoyment of making it, but I had the fantastic reaction from my family as it was opened............. Millie wasn't the only one feeling like she'd got a nice present, I felt like I was getting a gift too............. appreciation! 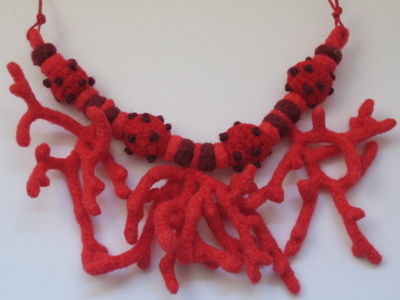 This was the first necklace I bought from Gooseflesh. I love Helle's work, and her blog, she is extraordinarily creative, and generously shares all she's doing on her blog. I know she's very busy, so I was nervously hopeful when I asked if I might commission a piece from her. She said she would be delighted to do something for me. And this is her fabulous creation. She even did a post on her blog about it. Helle crochets these forms, and then fulls them. I like the attention to detail of the tiny flowers on the ends of the cord, and that they can just dangle down your back if you choose............. If you haven't stopped by Helle's blog, I thoroughly recommend it, it's not just her jewellery that is inspiring....... at the moment she is creating an amazing piece from plastic bags. One more thing, I have to INSIST that you meet the star of this post on Helle's blog, Harry.